*Not a guarantee, unless otherwise noted. Dates are for estimated delivery before December 25. The actual delivery date may vary depending on origin, destination, Post Office acceptance date and time and other conditions. Some restrictions apply. For Priority Mail Express® shipments mailed December 22 through December 25, the money-back guarantee applies only if the purchase was not delivered, or delivery was not attempted, within two (2) business days. Thanks to more people shopping earlier and shopping online, the Postal Service’s “busiest day” notion is now a thing of the past. Instead, the Postal Service currently has the busiest time, and it starts two weeks before Christmas. 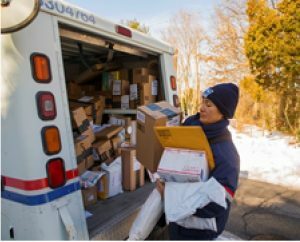 Beginning the week of Dec. 10, customer traffic is expected to increase, and the Postal Service plans to deliver nearly 200 million packages per week during these two weeks. The week of Dec. 17-23 is predicted to be the busiest mailing, shipping, and delivery week. During this week alone, the Postal Service expects to process and deliver nearly 3-billion pieces of First-Class Mail, including greeting cards.